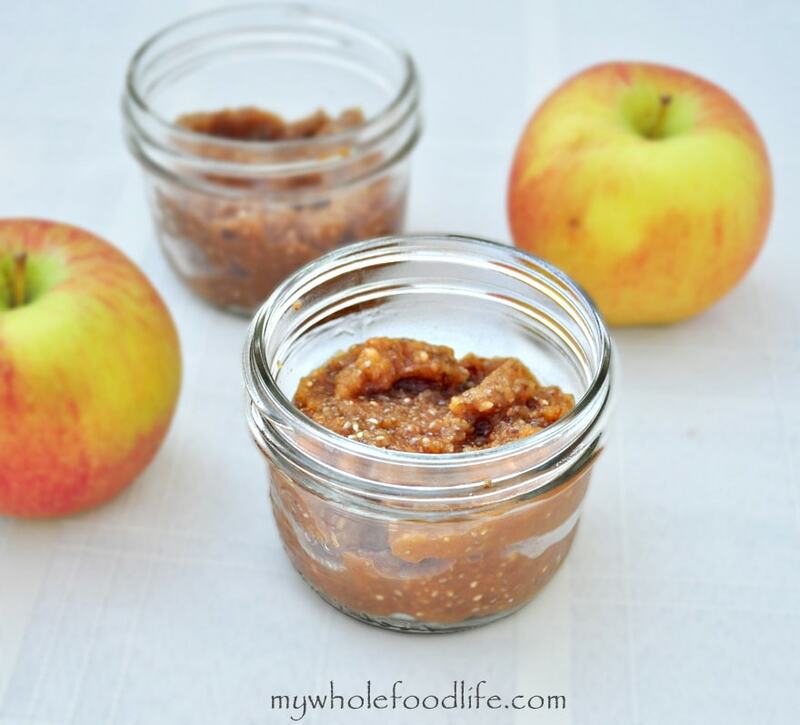 You need to try this Apple Spiced Refrigerator Jam. Everyone likes a little jam once and awhile. Most store bought jams contain too much processed sugar. Did you know you can easily make your own jam recipe without processed sugar, pectin or canning? I already have Blueberry Chia Jam on the blog. Since it’s almost fall, I thought I would make one that incorporated those flavors. This apple spiced jam recipe came out great. This is it and it couldn’t be any easier! I used chia seeds to help gel up the spread. This will literally take minutes to make. Spread it on toast, swirl it in yogurt, or even use it as a pancake topping! It would be great in overnight oats as well. Yum! In the food processor , blend up the apples. Then add in the remaining ingredients and mix well. Put the jam in a covered container and set it in the fridge to set up. Takes about 30 minutes to an hour. This made 8 oz of jam. I store mine in mason jars , but you can use any container. It should last a few weeks in the fridge and you can also freeze it for longer storage. Enjoy! I just made this and it's been sitting in my fridge about 40 minutes. It tastes yummy, but the chia seeds still taste "seedy". Should they eventually plump up and soften? It will still be seedy, but the seeds should expand and soften. Did they not do that? You can also try blending it if you don't like the seedy texture. It got better as I let it sit in the fridge. I used it as filling for your pop tart recipe, it's perfect! I am in LOVE with your Recipes!!!! I have a quick question though- where do you buy your mason jars? And what kind do you get ruler mouth or wide mouth jars? Thank you for all your amazing recipes.... Making larabars tonight!!!! Thanks Lauren! I get my smaller mason jars(the ones I use for oats in a jar) at Target. They come in a 4 pack. I think they are the wide mouth 12oz? I also get the larger 32oz jars a World Market. They sell them singularly. I think I am going to order a 12 pack of the large ones off Amazon because I use them for everything! I've made this as per recipe before, loved it so much that I just made it with sweet summer peaches. Equally yummy! Awesome! I bet it was delicious with peaches!